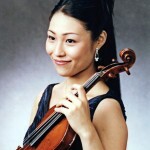 Mayumi Nakamura began studying the violin at the age of nine. By age twelve, she was a featured soloist on a live radio broadcast with the Hiroshima Symphony Orchestra. She has performed extensively as a soloist and chamber musician throughout Japan, South Korea, and the United States. Mayumi gave her New York City recital debut in Carnegie’s Weill Recital Hall in 2002. Mayumi also has a broad range of orchestral experience, having performed with the Atlanta Symphony, Charleston Symphony, Manhattan Chamber Orchestra, Hiroshima Symphony, Hilton Head Symphony, and many others. She received her Bachelor’s Degree from the Tokyo National University of Fine Arts and Music before moving to America, where she earned a Masters degree from the Manhattan School of Music in 2000 and a Professional Studies Diploma from the Mannes College of Music in 2003. Her teachers included Ariana Bronne and Todd Phillips respectively.